I’m riding for three main charities; Prostate Cancer UK, Cure EB (Formerly The Sohana Research Fund) and Carney’s Community. All very different but very worthy charities. Any donations you can make will be gratefully received, however small (or large). My aim is to raise a total of £50,000. It sounds like a lot (certainly to me) but with your help I really hope I can achieve that figure as it will make a huge difference to all three. I’ll have one Virgin Money Giving donation page which will split the money between all three. Please read the info on the charities below and check out their websites in the links provided. Thank you in advance for any donation you are able to give. Prostate Cancer UK deals with the research and victims of prostate cancer. Over 250,000 men across the UK are living with prostate cancer. The charity aims to help these people in any way it can, including setting up support groups or one-to-one sessions with nurses or someone who has been through the disease. This can be a huge comfort to many people living with a disease such as cancer and really goes a long way. The charity also focusses on researching treatment for prostate cancer. This is critical as cancer sufferers would be nowhere without it. Furthermore, any breakthroughs from this research could potentially be applied to treating many different types of cancer. Please see the link to their website below for much more information. Cure EB focusses on research for a cure for Recessive Dystrophic Epidermolysis Bullosa (RDEB). RDEB is an incurable, often fatal skin blistering condition caused by a lack of collagen protein in the skin. This makes the skin incredibly fragile, leading to blistering or skin loss at the slightest friction or knock. It is progressive, incredibly painful and can occur so deep that it is equivalent to a third degree burn. There are over 8000 sufferers across the UK, the majority of whom will succumb to a malignant skin cancer, before the age of thirty five. 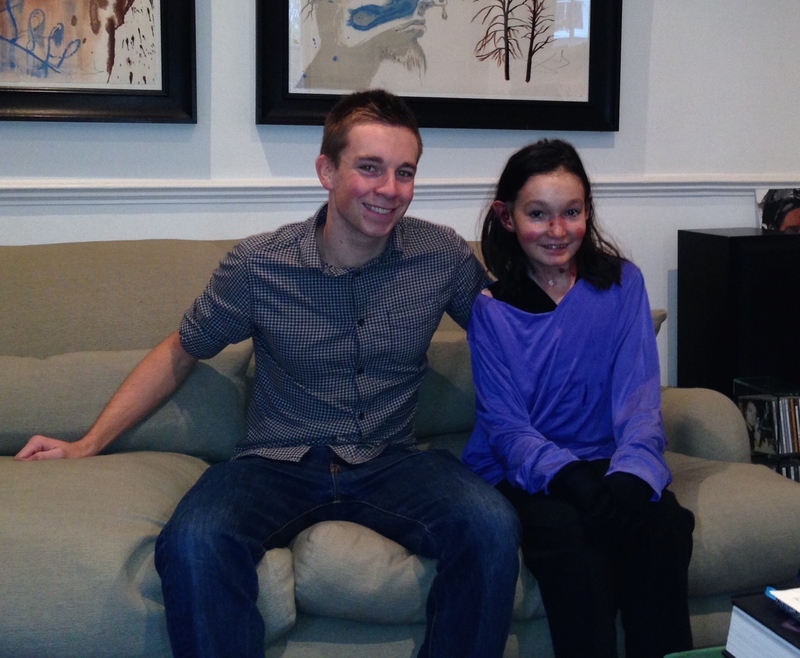 Sohana Collins is now 12 years old and, having met her, I can honestly say she’s an inspirational character. The mental strength required to live with this disease is unimaginable. I’m no-doubt going to face a fair amount of pain – particularly on the rear- after cycling 100 miles a day for so long, but quite frankly it comes nowhere near to what Sohana and all the other sufferers face 24 hours a day. On top of this, the limitations this disease creates must be unbearable. Having to live with the knowledge that you can’t participate in many basic activities that most of us take for granted. Personally, a life without sport – in particular cycling – would be hell and I wouldn’t want to even think about it. There is currently no cure for this disease but the money for research can go miles as there is so much potential for finding a cure. Not only this, it will open the door to so many other deficiencies that as of yet, cannot be cured. Please check out the links below to look at the Cure EB website. Carney’s Community is a small charity that focusses on turning around the lives of underprivileged youngsters. Children that are born into a life that presents very few opportunities and often victims of child abuse, are driven towards crime and antisocial behaviour through having no other option. Personally I’m lucky enough not to have been in this situation so I am in no place to judge or speculate about what I would have done in their shoes. This charity focusses on helping these people whilst not justifying their actions. They use boxing as a way of channelling the young people’s minds into something they enjoy, which is both mentally and physically beneficial. It also pairs the boxing with mentoring that provides the youngsters with someone to talk to, discuss any issues, and helps get them on the right track. The video of a talk by George Turner (manager and co-founder of Carney’s Community) below explains everything much better than I can and really is worth watching. There is also a link to their website and to a more detailed write-up of what the charity does below.